In partnership with Oxfam; the Samansco team set out to impact the lives of people living in a community that had fallen victim to the creeping effects of global warming. 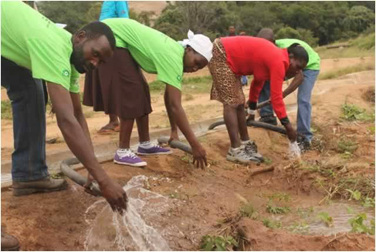 Our objective was to design and install a piped solar water system for an irrigation project scheme in Gutu. “Rural Sustainable Energy Development in Zimbabwe” was an initiative by Oxfam set to assist close to 20,000 people in the Ruti area. Samansco installed a Lorentz solar water pumping system for large scale irrigation in the Ruti area. The system was designed to promote the use of solar and micro-hydro energy through the use of the Ruti Dam. The impact assessment of this project exceeded both the expectations of Samansco and Oxfam. Since its inception, 40 hectares of communal gardens have been cultivated. The community has come together and created agricultural enterprises through the growing and selling of their own produce. The project has rapidly transformed the lives of the people in the community, this is truly a flagship project for sustainable development.